With a petition to legalize recreational marijuana in Michigan signed and certified, the issue will be decided by popular vote in November. But questions abound. Will a smoking lounge pop up on every corner? Will corn fields give way to leafy green pastures? Will the state get rich quick, or spend all the money battling reefer madness? In short - what would legal marijuana actually mean for the state? 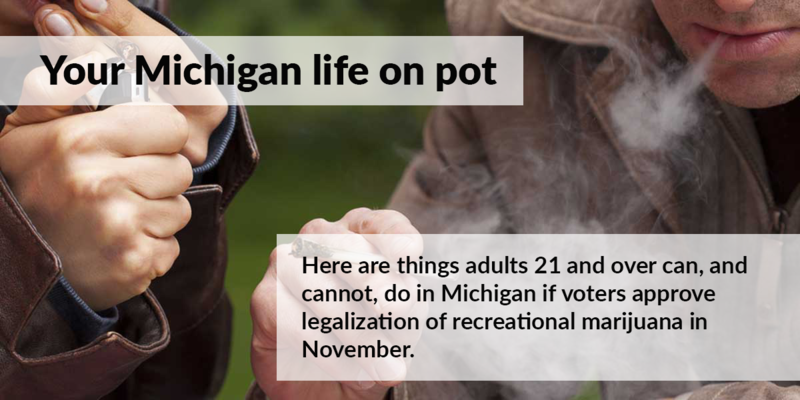 Dec. 4: You can smoke pot in Michigan but not buy it. What you need to know. Residents can possess up to 2.5 ounces of flower (marijuana product smoked in joints), or 15 grams of concentrate, which is the resin from cannabis plants used for edibles, dabs, vaping, and other products. 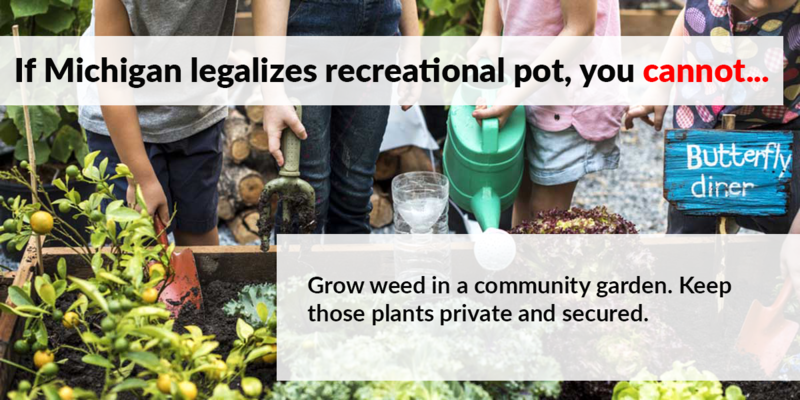 But watch where you tread: Cannabis would not be allowed on the grounds of a K-12 school and would remain a felony on any federally owned property, such as a national park. Talk about a green thumb. A household would be permitted to grow up to 12 plants, the limit regardless of the number of adults living there. Any outdoor gardening would have to take place in a secure area where the plants are not easily visible to the public. 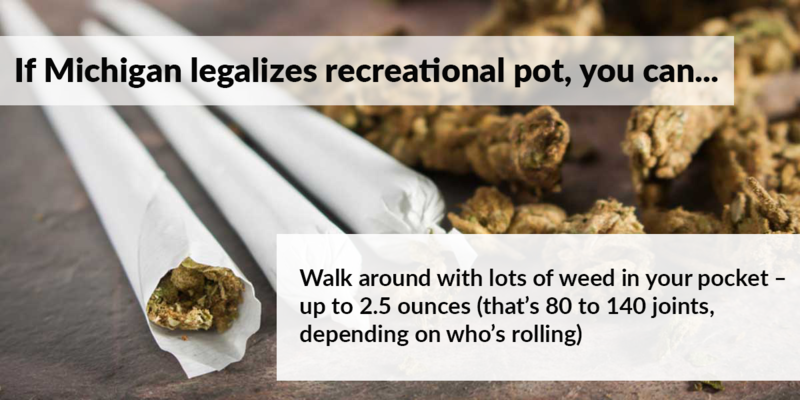 While personal possession is capped at 2.5 ounces, a household can have up to 10 ounces (as many as 560 joints, at 56 JPO, for those counting at home). This holds true even if five or more adults over the age of 21 live together. Advocates say the 10-ounce limit only applies to marijuana products purchased, and not to pot grown on the property. Product grown at the home would not be counted toward the household limit. Lowell said this provision was added because the Coalition “didn’t want to make a situation where if somebody happened to have a good harvest...they broke the law” despite all of their actions being legal. 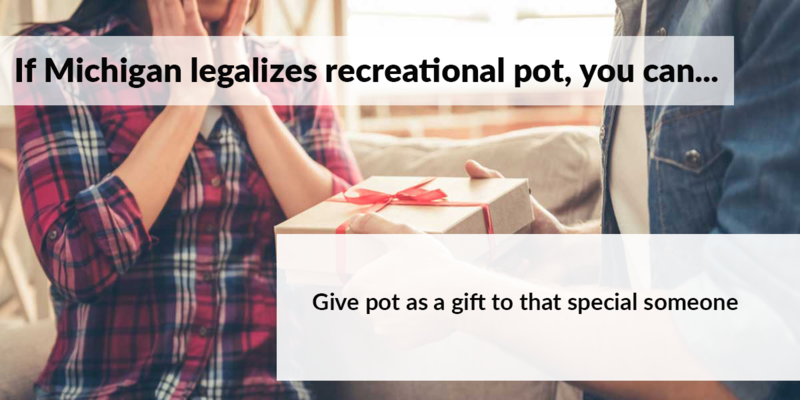 As long as the giver and recipient are over the age of 21, giving cannabis products as a gift is permitted. How much would this take out of your holiday budget? Other states have varying tax rates, affecting the price. ColoradoPotGuide.com, citing data from the cannabis market research firm BDS Analytics, reports that the average retail price in spring 2017 for one gram of flower was $6.92. Washington state was $5.87 per gram. That is enough to roll roughly two to three joints. The initiative lays out three tiers of business licenses for marijuana growers, scaled by the number of plants a farmer can cultivate. A class A business license would allow up to 100 plants at any one time, class B is 500 plants, and a class C license permits up to 2,000 plants. For the first two years, according to Lowell, those already operating businesses licensed under Michigan’s Medical Marijuana Facilities Licensing Act would receive priority for an equivalent recreational marijuana license. 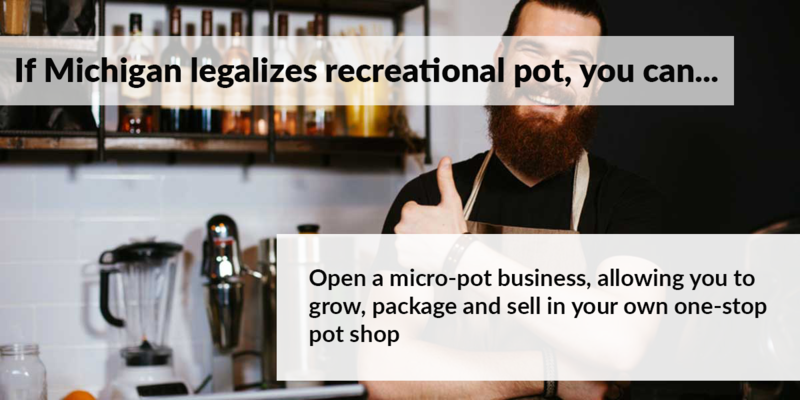 Inspired by microbreweries, a marijuana microbusiness license would allow for vertical integration. Permitted to grow up to 150 plants, a microbusiness could process, package and sell its crop to adults. They are already legal in California, but have not proliferated because of zoning and licensing delays. Even if voters approve marijuana at the state level, locals keep some control. 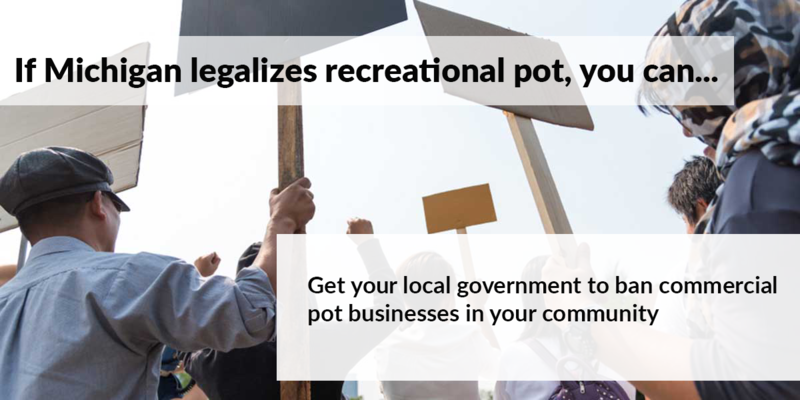 Municipalities can place harsher restrictions on marijuana businesses than the state, such as by capping the number of licenses, or banning commercial cannabis altogether. Residents can petition their town for such ordinances. 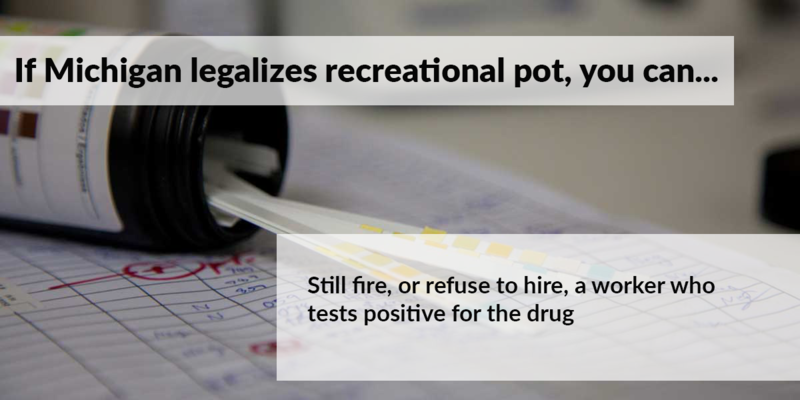 Even though the law allows it, pot may still violate your employee handbook. After speaking with the business community, Hovey said the coalition “felt it was important for business to have the right” to test employees and reject or fire them for failing a drug test. Some industries, such as trucking, would be required by law to continue to do so. Just as landlords have the right to ban smoking cigarettes on their property, they can also prohibit smoking cannabis product. It’s possible this initiative would not allow them to completely bar cannabis consumption. 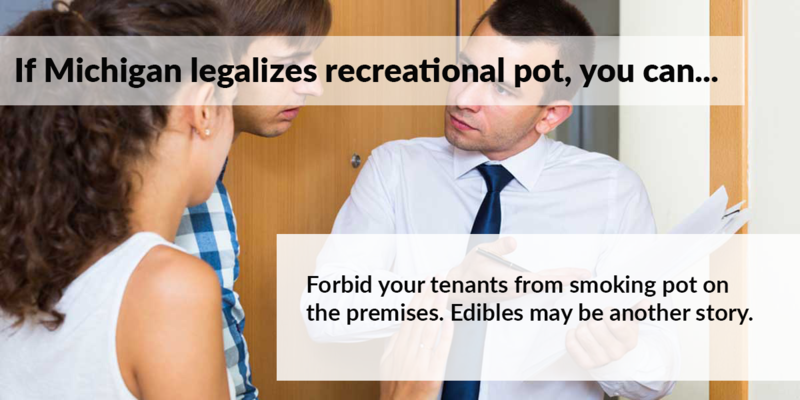 According to Hovey, landlords would not have the right to ban consumption in other ways, such as edibles. Chartier supported this interpretation but said she expects litigation on this issue. Move over, cigar bars and hookah lounges. The initiative gives municipalities the right to zone areas for businesses that permit consuming pot. These businesses would not be considered public spaces, exempting them from the portion of the law that prohibits consumption in public. 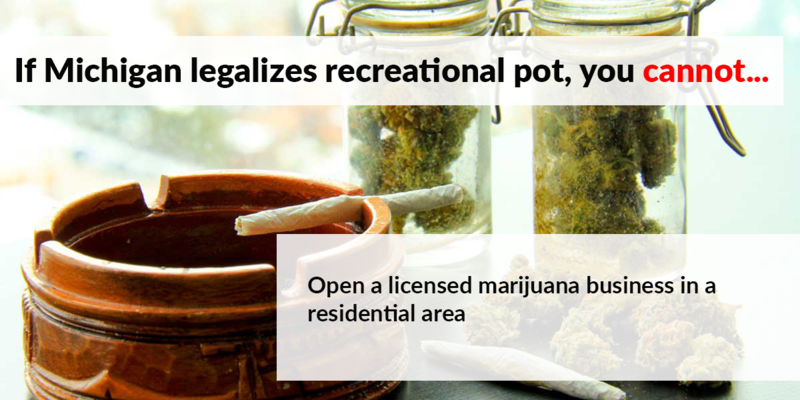 Not only are households limited to 12 plants, you cannot open a licensed marijuana establishment in a residential area. 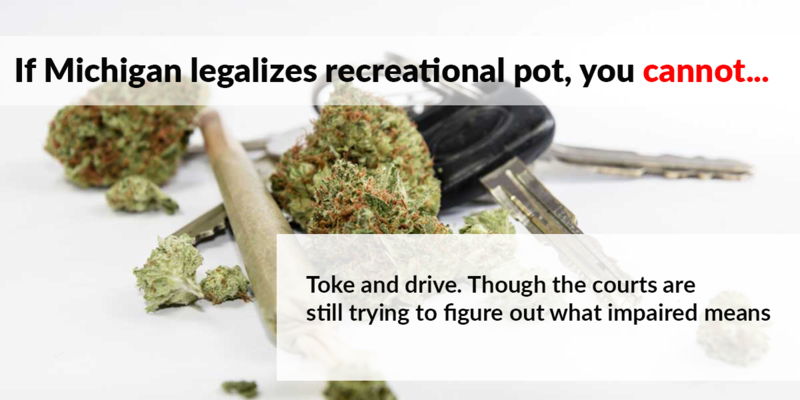 Just like alcohol, it would be illegal to operate a vehicle while under the influence of marijuana. Exactly how this portion of the law would be enforced is murky. “There isn’t a good way to test people on the side of the road,” Greenlee said. There are also no national standards to determine drugged driving. Unlike alcohol, tetrahydrocannabinol (THC), the active chemical ingredient in cannabis, remains in the system long after it continues to have an effect. As states have begun to legalize recreational marijuana, a variety of methods have been developed to test if somebody is stoned behind the wheel. iPad apps, blood tests, and saliva swabs are among potential solutions, but as yet there is no universal yardstick to certify cannabis impairment. 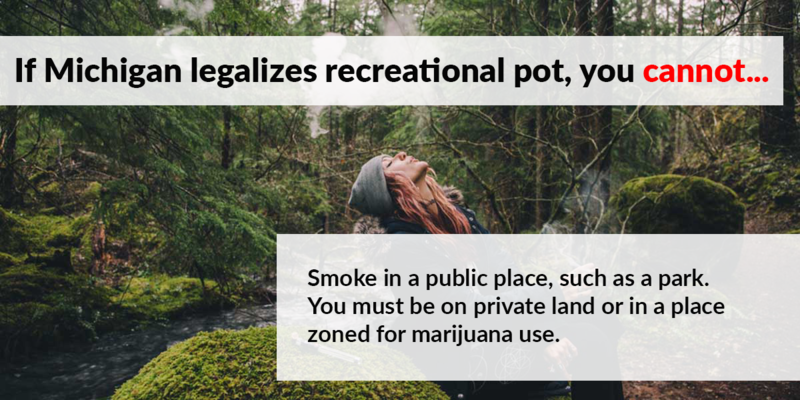 Smoking recreational marijuana would not be allowed in public. If you choose to indulge, you would have to do so on private property or in a business zoned for marijuana consumption. “If you are saying ‘Buy a bottle of water and get a free ounce of marijuana,’ that would be illegal under our initiative,” Hovey told Bridge. 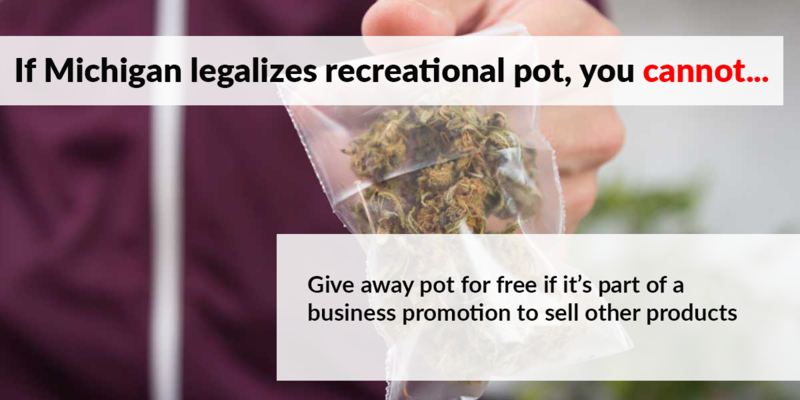 This would prevent businesses from distributing marijuana products without being approved or avoiding having to pay for a marijuana retailing license. 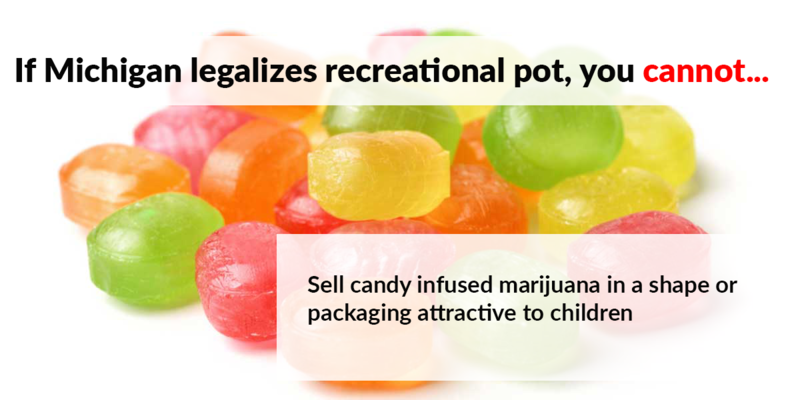 Candy infused with marijuana that is in a shape or packaging attractive to children would be banned. Looks like you may still have to head to California for those Cheeba Chews. Hold on before you start devising a mail-order marijuana business model. The post office is run by the federal government, which continues to consider marijuana a Class I controlled substance. Shipping marijuana, even if it stays within Michigan, would remain illegal. Commercial shippers may have leeway to deliver marijuana products, but the area remains hazy. Other states have not seen marijuana-by-mail flourish. 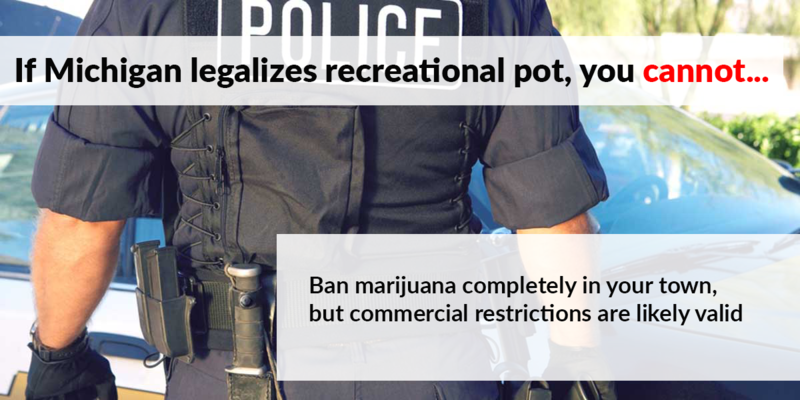 Though local governments can ban or limit cannabis businesses, they cannot ban marijuana completely. Initiative language explicitly states they cannot restrict the flow of marijuana products being transported through their boundaries. Unless, of course, you are willing to go through the licensing process. Selling marijuana would require getting a license and paying associated taxes to be a marijuana retailer, and products must be tested before being placed on the market. #9. Expect this to be violated widely and easily. A cash sale between friends off the books is going to be simple as long as you don't have a parade of people coming and going from your property. That would be ILLEGAL under CRMLA and will exclude you from the Protections within CRMLA, thereby making you An Old School Dirty Drug Dealer. Those arrested for "Illegal Transfers" will be prosecuted for Manufacturing with Intent to Deliver (CRMLA Makes this an Authentic Charge now), Tax Evasion, an Operating without a Lie-Sense, and potentially Food Safty Issues as well if you happen to make your own Edibles. CRMLA takes Prohibition and makes it much worse. 3 Deceivers and One Gullible fool lost in the 1937 Reefer Madness lie. this is like the Government saying you can have a 12 pack, but if you have a 15 pack you're just a dirty drug dealer. You can Give it away, but DONT YOU DARE Accept a Bagel in return. That is Remuneration and guess what? Under CRMLA Remuneration makes you a Dirty Drug Dealer. Have a joint in public? Guess what? That is a Crime under CRMLA and will get you a LARGE FINE, and possible Jail Time. Have over 2.5 oz of dried pot in the house. Whoops, you just broke the Law, and now you're just a dirty drug dealer. Smoke a joint 2 weekends ago, and have a small fender bender on your way home from work? Guess you were Driving Impaired and are just a Dirty Drug Dealer and need to go to jail. When Police Regulate Pot Like Booze, they will be Arresting you in even larger numbers than is already happening today. Arrests have went UP since 2008, not down. And when you allow Government to arrest you for pot as frequently as people are arrested for booze, which cannabis is Nothing like, the increase in arrests is going large. They call it Legalized Recreational Marihuana Like Alcohol, but all really is, is Legalized Prohibition with a dozen more ways to arrest people, particularly those of Color, for Pot still. Except now, it will happen 3 to 5 times as much. Just say No to C.R.M.L.A. and Scott lost in the Lies Greenlee. Both of them are deceiving you for their own personal Gain. It is time to END Cannabis Prohibition and not Legalize it like booze. Before 1937, Cannabis was Lawful, not Legal. That means the Government had no Authority to "Regulate Marihuana", and they really never did. Slow down. We will get there one step at a time. Many of us cant buy it legally, so dont use it because we want to follow the law, but desperately want to. First lets get rid of the stigma, second lets get rid of pharmaceutical companies that prescribe us lies. Later, in the end we can have your conversation. This slide show is a design nightmare.... and someone needs to rework it asap. By the time I got into the (can't) section... I had stopped reading the header line, and was subconsciously reading the can'ts as cans, and thinking well that's not good why would I vote for that??? The word "can or can't" should be with the lower discription text.... and even better in bold Green & Red. At least we will have fewer poisoned children if you don't come to our state. This is factually inaccurate. Cheeba Chews has nothing to do with the Flint water crisis caused by a bean-counting appointee of the Governor, nor the complete bungling of the recovery process (and attempt to cover up during the 2014 election cycle) by MI’s repulican dominated legislature. If you are truly worried about poisoned children (a claim which I view with a jaundiced eye), look to Lansing, not Colorado. I can hear the mic drop from here. "Greenlee predicts that having among the highest household possession limits in the nation (most states allowing legal weed cap household limits at 1 ounce of flower) would make “Michigan the weed capital.” False. 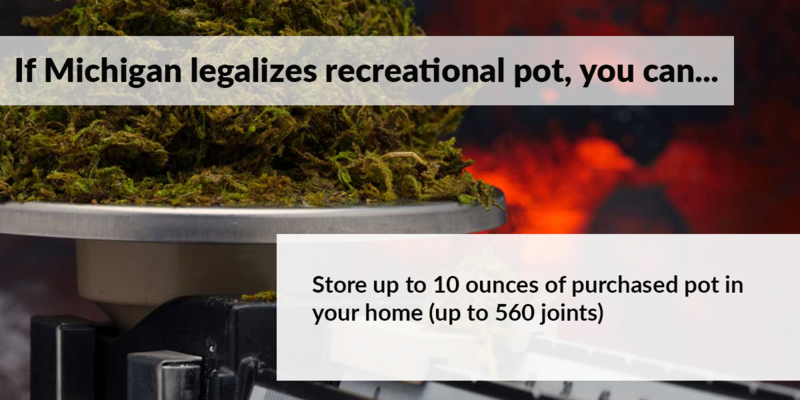 All states except 1( Washington State) allow over an ounce in the home and allow you to keep whatever you grow. So the idea this article is spreading that this law has these recklessly high possession limits is based on falsehoods! Please be better at Journalism next time! Might want to mention that you CANNOT bring it over the border from Canada, even though it might be legal in both places. Marijuana is illegal under US federal law and is a Schedule 1 narcotic. US Customs and Border Protection will treat it (and you) the same as if it were cocaine or heroin. in regards to marijuana laws in michigan, I do believe the above information is incorrect! 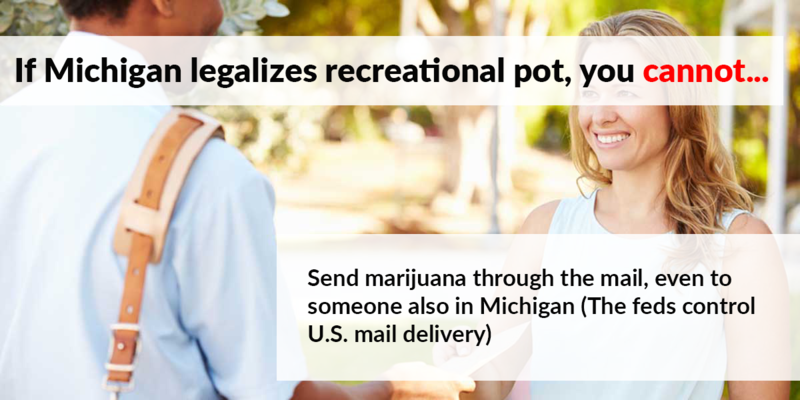 Unlike many states, Michigan is unusual in that possession and marijuana use are not penalized based on the amount of marijuana you are carrying. Instead, all possession and use charges are treated the same. In Michigan, possession of any amount of marijuana is a misdemeanor that carries a $2,000 fine and a maximum of a year in jail. Smoking or ingesting marijuana is a separate misdemeanor. In most locations, including your home, marijuana use will only get you 90 days in jail and a $100 fine. Possessing marijuana in a park is a more serious crime, which can even be deemed a felony at a judge's discretion, and this crime carries a two-year sentence. Hey, Bridge: maybe you should stop worrying so much about workers smoking pot in their free time if you're having trouble finding skilled workers who "don't do drugs"
Gimme a break... If they are smoking pot on their "free time"...theyre damn sure smoking it on their way TO work...on lunch breaks...and any other time they can get away with it. Potheads dont limit their use to only when they have, like, NOWHERE to go for the next few hours. They are absolutely high at work,...high while driving...high while caring for their children...they are high ALL THE TIME. The difference between alcohol being legal and now, weed being legal, is that there are many people who drink booze responsibly...and then theres alcoholics who drink it all the damn time. Now, heres the difference I was talking about: People who smoke weed, make it a lifestyle. They are KNOWN for being high 24/7. This new Michigan law is going to make it so so many potheads now go to jail for driving while high. Congrats, Potheads...you just brought the law into your illegal world...even more so,...than ever before. Your baseless assertions are incorrect. Every person is different in each situation. Sad you haven't learned that yet. You obviously have a preconceived notion of everyone that has ever used cannabis. You are of course, very, very wrong. I would venture to say that there are more people that abuse alcohol than ANY other drug (and yes, alcohol IS a drug) Like drinkers, there are many cannabis users that simply come home from a long day and smoke a bowl or two to relax. And as you know (or should know), cannabis is not addictive in the way that alcohol is. You state that "People who smoke weed, make it a lifestyle". I contend that the same holds doubly true for many users of alcohol. We have all been annoyed by friends that seem to make alcohol such a huge factor in their lives. We've all seen lives ruined and families broken up because of drinking. You call everyone that uses cannabis a "Pothead", but do you call everyone that drinks alcohol a drunkard? or an alcoholic? Do all of your friends that use alcohol in their free time drink at work. Your ignorance is at both amusing and alarming. Educate yourself PLEASE. Thanks for your comment Mark, That's a nice way to try and help someone who obviously knows nothing about People that use Marijuana after a long day in our more and more stressful life that seems to be looming in the future. I do not agree with what they said at all, I've been using for years now and I "Never" Smoke before work or Drive a Car, and been using for 50 years, It's all about relieving a day full of Stress, and not one time have I ever seen a violent Pot Smoker, But have seen time in and time out how angry some become after Drinking Alcohol. Maybe we should limit how many cups of Coffee, JK btw we can have a day, after all coffee is a drug and can do more harm than Pot. There are far more dangerous thing we allow without a second thought, and to treat pot like alcohol is not right, and if they do treat it like alcohol it won't be just like it, they will make sure when you're at a place where you can drink, you certainly won't be allowed to Smoke. IMO only Certain Parties do not want We The People to have a real say in how we live, It seems the only thing that matters is MONEY. Everything if you follow goes right back to Profits and how much can we make off them. And it's never been a problem, imagine that? But now you want to make it a problem because it's not your cup of tea. Well too f'ing bad, a great number of Americans are sick of people like you and your scare mongering on a subject you know little to nothing about. I don't smoke weed but I love freedom. Try that sometime you might like it. 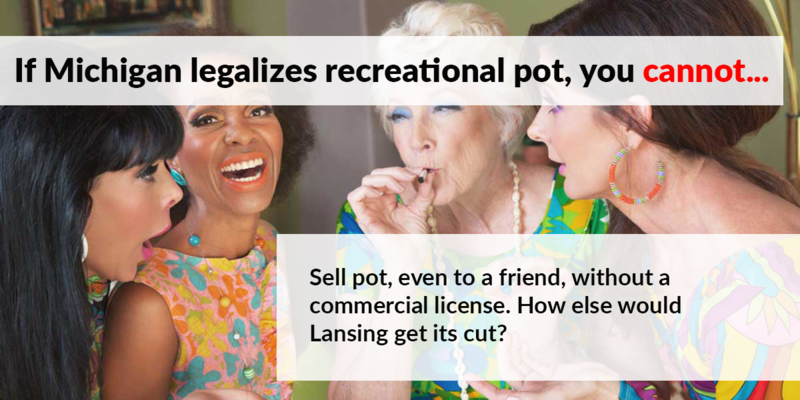 Whats gonna be the law on out of staters being able to buy in Michigan.? I live right on the border in Indiana. Im less than a quarter mile away. I know thats still not Michigan. But none the less, will it be like Colorado where out of staters can buy so much a day? Crossing State lines with Pot becomes a Federal issue, doing so it's not legal in the U. S. period. Michigan does not “break from the pack” when it comes to possession limits as described. Bridge even includes that Maine has the same limit. 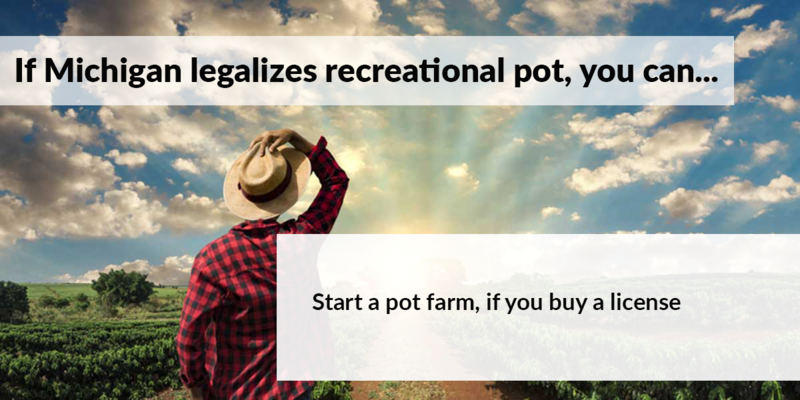 As the most recent version of legalization, such limits and restrictions ought to evolve. Particularly, since there has been no reasons presented from the other legal states to keep or include other restrictions. In addition, the amounts are the same that the medical program created in 2008. There is hardly anything mentionable about it - except to demonstrate evolution in legalization programs- and it is most definitely not a sensational provision. but dispensaries wont be open that quick. 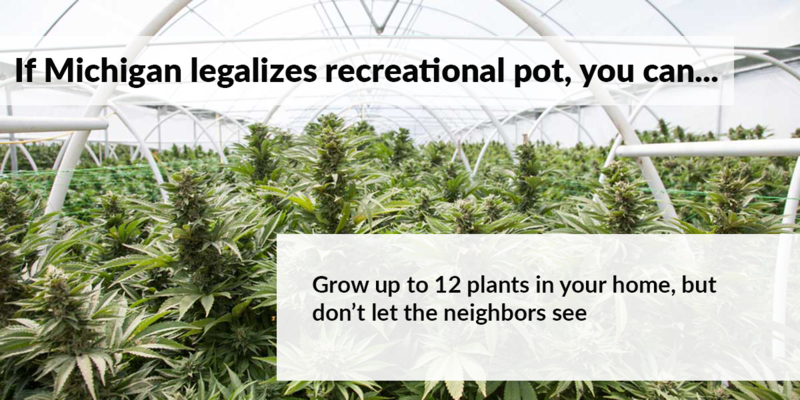 Can you grow 12 plants in your home that’s by a school zone ? Smoking Strong Now My MidWest Bruthus!!!! Ah Ha.....The Old Rt Wing Republicans Finally have to Sit Down & Shut It!!!!!! When it becomes legal (Dec. 6th) will I be able to go to the medical marijuana dispensaries to purchase for myself now? Cani grow my 12 plants in school zone. Meaning school is a few houses away ? What about growing in your home near a school? Can you grow with minors in the home? Can a Michigan resident get into trouble gifting someone cannabis that lives in Ohio if the Ohio resident gets busted trying to sell it once he is back in Ohio.